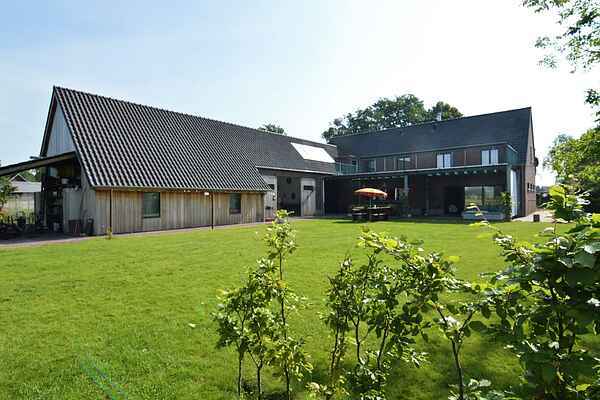 Beautiful farmhouse with a huge garden, situated in a wooded area. The farmhouse was designed by the owner and built with mostly recycled materials. You'll really feel at home if you like a combination of industrial and vintage. Many items and decorations were brought home from travels all over the world. From the covered terrace with a wonderful lounge sofa you have a view of the large garden, which ends in a meadow with ponies. The large table on the terrace is ideal to have breakfast or a barbecue together. It's also the perfect setting to play some nice games. Just like the large dining table inside. While having a cup of coffee, you can enjoy looking at the ducks, rabbits and chickens walking around freely in the garden. Great for the children. There's a beautiful studio you can make use of regardless what the weather's like. There's table-football for the fanatics, but it's also a wonderful place to read a good book. The suspended lounge bed in the garden offers the ultimate relaxation. There's even an old-fashioned wood-fired hot tub. Now that's really nice during the cooler evenings.